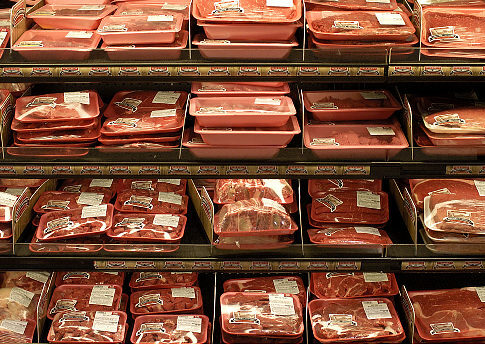 People hostile to American consumerism (that would be the AGW/Green crowd), as well as vegetarians and PETA people (often the same people as the AGW/Green crowd), like to point out that Americans, by buying their meat neatly packaged at the grocery store can ignore the living, breathing animal behind that ready-to-cook slab of meat. They can also ignore the slaughtering process, and the slicing and dicing that follows slaughter. American consumers are also mercifully separated from the pollution that the whole meat industry creates, whether at the farm end or in the abattoir. With that in mind, can someone explain to me cars that are entirely electric, such as the Chevy Volt or the Nissan Leaf. Hybrid cars create their own electricity, but these 100% electric cars need to be plugged into an outlet, in exactly the same way as that energy sucking computer or electric dryer. Sure the cars run clean at the car end, but aren’t they the car equivalent of packaged meat? The electricity that powers them has to come from somewhere and, unless you can tell me otherwise, I’m assuming it comes from coal or fuel burning power plants. Likewise, I understand that the process of making these cars’ batteries is pretty darn dirty, not to mention so expensive that the only way rich people can afford to buy them — or are willing to buy them — is with hefty government subsidies. UPDATE: Having read everybody’s contributions, I’ve concluded that government machinations preclude an accurate answer to this question.